Lititz Borough Hall is located at 7 South Broad Street, Lititz PA 17543; phone: 717-626-2044. 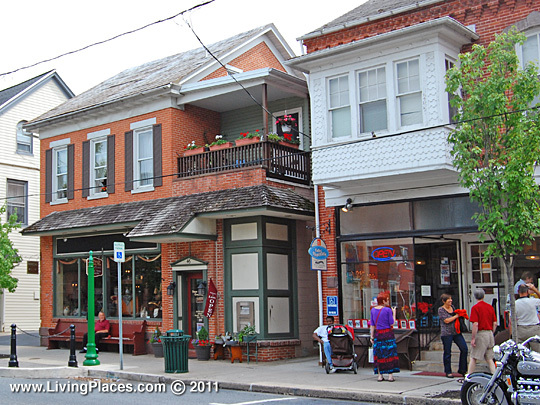 Photo: East Main Street, Lititz, PA (June 2011). The roots of the Moravian settlement in Lititz began in 1754 when John George Klein, local farmer and landowner, offered his 491 acre farm to the Moravian Church for a new settlement in Pennsylvania. In 1755, Count Zinzendorf and members of the Moravian Church visited the area and approved the site for a new settlement. This new settlement was named Lititz in 1756 to commemorate the 300th anniversary of the year (1456) when Feudal King Podiebrad befriended the persecuted Moravian followers of John Hus at his castle of Lidice in Moravia. The purpose of this new settlement was to serve Moravian Church members in the colonies and immigrants from Europe who desired close spiritual supervision but were not willing or fitted to live the religious communal life called for in the institutional arrangements at Bethlehem and Nazareth, Northampton County, PA. At Bethlehem and Nazareth, Moravian members were required to live in community houses and pool their labor for the good of the congregation. At Lititz, each family would be permitted to live in their own house, if desired, and each family head could run his own business. The town was surveyed into building lots in 1757 and a large open square with important communal and religious structures enframing it was planned. Building lots were then leased to congregational members for the construction of residences. Streets were laid out including Main Street (now East Main Street) and the Road to Tulpehocken (now Broad Street). Wiley, Mary T., Historic Preservation Trust of Lancaster County, Lititz Moravian Historic District, nomination document, 1985, National Park Service, National Register of Historic Places, Washington, D.C.